I am very literally kicking myself, I have never once used anything with coconut in it. Yes I know I am a fool, I’m missing out on a gorgeous scent and some amazing products. I have promised myself this year that I am going to buy more products with mainly coconut in it. This was mainly because my friend gave me 2 testers to try for my birthday. I feel very silly for not noticing these amazing products earlier!! 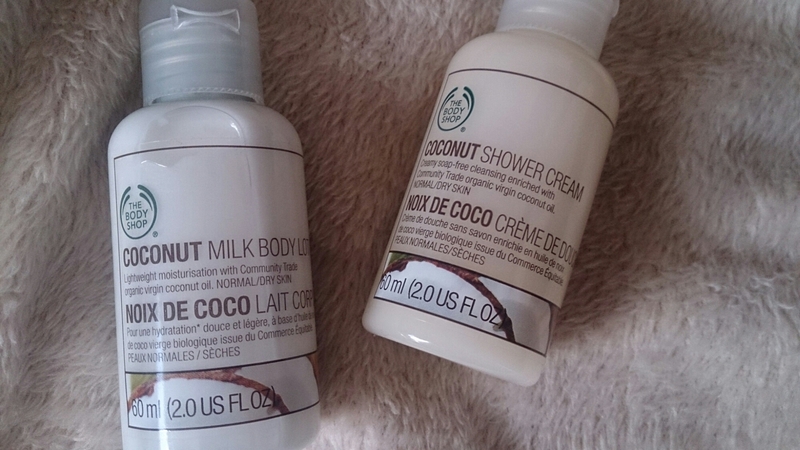 These coconut milk body lotion and shower cream are from the Body Shop. I wasn’t expecting much when I tried them and was pleased that I got a lovely whiff of subtle coconut. I love how it doesn’t smell like chemicals!! The milk body lotion is something I have not tried before. Comparing it too what I usually use, which is a body butter I personally like that the lotion does not become greasy when used too much. I love how it soaks into the skin leaving it soft and giving it a lovely healthy glow. I prefer to use lotions and body butters after a shower and before I go to bed. I may be using this more, along with a body butter of course.